The D-Day landings and the campaign in North West Europe in 1944 and 1945 are normally thought of as beginning in Normandy on 6 June and ending in Berlin on 8 May 1945. As usual with anything military history related, the real story behind the scenes is much different. The whole campaign from D-Day onwards depended on much preparation in Britain for months, if not years afterwards. In fact, virtually every corner of Britain will have some kind of connection with D-Day. Millions of troops in Britain – British, American, Canadian and from many other allied nations – had to be accommodated somewhere. They all had to train somewhere. Equipment had to be manufactured and stored; supplies had to be delivered. There were marshalling camps, embarkation points; places where Mulberry Harbours were constructed. Dockyards, airfields, factories. The many units and organisations required numerous different headquarters. It is pretty obvious that in early 1944 Britain was one large armed camp geared up towards becoming a launchpad for the second front. We’re currently working on a new page on the D-Day Museum website called ‘D-Day on your Doorstep’. Over the coming months we will be adding D-Day related locations to the map, and building a picture of Britain’s role in launching D-Day. We would love to hear from you if your area has any D-Day links, or if you would like to add any detail to the locations that we have already uploaded. To see the ‘D-Day on your Doorstep’ page visit the D-Day Museum website here. I’ve been following with interest the stories of two particular ‘grey navy’ warships of the twentieth century: the Great War vintage Destroyer HMS Caroline, and the Falklands veteran Frigate HMS Plymouth. I’ve gone on record before with my opinion that warship preservation in this country is woeful. We have a marvellous collection of older historic ships – Mary Rose, Victory, Warrior, Trincomalee, Great Britain to name but a few. But HMS Belfast aside, we have a terrible record of preserving twentieth century warships for the future admiration of British people who did not live through those turbulent years. It’s an inadequate tribute to the millions of British men – and women – who served with distinction during some of Britain’s finest years. Portsmouth was perhaps the first place to really tap into the naval heritage idea. Of course, HMS Victory went into dry dock here in the 1920’s, around the same time as which the Royal Naval Museum was founded. With the freeing up of space and docks in the yard as it was run down, HMS Warrior and the Mary Rose joined in the 1980’s, making a fine collection of ships. There was definitely a concerted effort to develop the historic dockyard in Portsmouth, with an awareness that the Royal Navy and the Dockyard were winding down, and that tourism would be a growth sector. Yet what is really missing is a ship from the ‘grey navy’, the twentieth century. Time and time again ships have been decomissioned, and ideas for preservation mooted, with nothing happening and a flood of fine old ships going to the breakers yard. Personally I think that HMS Fearless would have made a fine museum, with a flight deck for various events, and a tank deck that would have given plenty of potential for exhibitions etc. It also would have made a useful link up with the Royal Marines Museum. At present HMS Caroline and HMS Plymouth are the two most prominent warships up for grabs. But both, steeped in history, are at serious risk of going for razorblades. 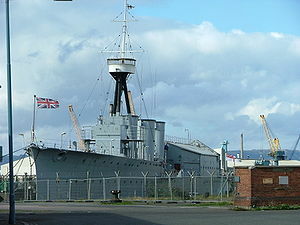 HMS Caroline was built in 1914, and served at Jutland. After the end of the First World War she was decomissioned and has served as a naval reserve depot ship in Northern Ireland ever since. She was finally decomissioned in March 2011. She is formally under the ownership of the National Museum of the Royal Navy, based in Portsmouth. There have been plans to open her up as a museum ship in Belfast, but nothing more than public pronounciations. It’s time for definite action if they want to keep her there – such an important ship should not be allowed to sail into oblivion because the city leaders in Belfast can’t come up with a plan to make good on their promises. The MOD will commence disposal procedures soon if a concrete plan is not formed for her future use, and the National Museum of the Royal Navy have promised that if Belfast cannot get their act together she will be brought to Portsmouth. Presumably if that happens then we’ll hear a lot from Belfast about the pesky English stealing their ship. If it matters that much, they’ll find a way. Somehow I doubt it. Whatever happens, she should be preserved as closely to her 1914 appearance as possible, where as many people as possible can see her and appreciate her. The Falklands War veteran HMS Plymouth, a Type 12 Frigate, is also in a vulnerable state at present. Decomissioned in 1988, for some years she was a Museum ship in Birkenhead. However, In 2006 the Trust that owned her closed, leaving her homeless. She is still in Birkenhead, but time is running out to find a permanent home for her. Plymouth has expressed a trust in homing her, fittingly in her old home port and namesake city. However, the offer of a berth at Millbay Docks was withdrawn in 2007, and it has been rumoured that she has been sold for scrapping – these reports are, as far as I can tell, unconfirmed. The situation with inactivity is similar to that in Belfast – Plymouth City Council has ‘expressed an interest’, but nothing more. Plymouth’s record on naval heritage isn’t so much woeful, but non-existant. Time and time again we hear MP’s Plymouth pleading that the loss of the naval base would decimate the city. Yet virtually nothing has been done to develop any kind of alternative industries or maritime heritage sector. We’re constantly being told that Devonport is the largest naval base in Europe. Look on google maps, and then the list of RN ships based in Plymouth, and you can see that there is plenty of superfluous space there. There was a possibility at one time that she could come to Portsmouth, but to be honest she has very little connection with Pompey, and if it comes to a choice between Caroline and Plymouth, the authorities will probably choose Caroline. Personally I would like to see both preserved, and maintained to their 1916 and 1982 appearance respectively, in a setting that does them justice. But we just don’t do warship preservation in this country. I’ve done a bit of research on Museum ships in the US – they have seven battleships, five aircraft carriers, once cruiser, five submarines and two destroyers. Considering Britain’s proud naval history, what we have left is a poor return. Although they are large and expensive to maintain, ships should be seen in the same context as how museums develop their collections of other historically important artefacts. And what better way to display naval heritage than in a ship? Any other way seems inadequate in my opinion. Reading about the Nelsonian navy is one thing, but going onboard HMS Victory is on a different planet. It just needs more planning and foresight – potential museum ships need to be identified before they leave service, and chosen for their suitability. Regular readers will be pretty aware – and possibly tired of me stating the fact! – that I have quite an interest in military museums. I’ve visited more than I care to remember, and in recent years I have made use of more than a few in a more professional capacity as a researcher and author. And having worked in museums in a number of capacities, naturally I have thoughts about the direction – or lack of – that some military museums are heading in. The Ministry of Defence, facing serious budget pressures, has recently introduced a new report looking at the way that it supports Army museums in particular (as featured in the December issue of the Museums Journal). This month’s journal features an editorial from Richard Smith of the Tank Museum, Bovington – one of the more forward thinking military museums. The Army currently supports 69 museums – infinitely more museums than there are Corps and Regiments in the modern Army. This is a legacy of a shrinking Army, which 50 years ago had scores of country Regiments, various Corps for every little function, and all kinds of other oddities. Between them these Museums host 5 million visitors a year, working out at an average of 72,000 each. When we consider that some such as Bovington will be getting much more than that, it is not too difficult to imagine that – to take a made-up example – the museum of the Royal Loamshire Fusiliers, merged in 1960, is probably a couple of rooms in Loamshire and gets about 5,000 visits a year. I am not too sure that you could argue that military museums per se are industy leaders, as Richard Smith. SOME are – Bovington and the Imperial War Museum perhaps, and some of the more visionary provincial museums – but for every progressive museum there are plenty more standing still. Sadly, I think that it is probably right for the MOD to withdraw funding for museums 25 years after a Regiment has been amalgamted or disbanded. After 25 years, if the local community, old comrades etc have not managed to get the Regiment’s heritage onto a self-sustaining footing, its probably time to look at other options. With budget pressures, spending on heritage has to concentrate on what is relevant to today. Army museums have to adapt or die. Appointing the National Army Museum as a sector leader is a positive move, and perhaps they could take on a leadership role much as the National Archives does for records offices and other repositories. Museums need to work together better – perhaps shared posts are an answer, as might be joint working such as travelling exhibitions, integrated events and education programmes, and increased loans. I also think there is much potential for army museums to work more closely with ‘civilian’ museums. With the hundredth anniversary of the Great War looming, it is a perfect opportunity for local Regimental Museums to co-operate with the local town or city museum on putting together co-ordinated exhibtions, and loaning each other objects and materials to mutual benefit. The military, and by default military museums, should not sit divorced from society, but should look to become more involved in it. Regiments recruited from their area, losses in battle affected their communities, and veterans demobilising went back into society changed by their experiences. Their stories should be told in a ‘joined-up’ manner, not in dusty isolation. Society at large is where the visitors, income and school groups come from that will keep many a small museum alive. Many museums have great potential for school groups, by linking into the national curriculum. Technology and Science is presented in museums such as REME at Arborfield, Logisitics Corps at Deepcut and Signals at Blandford Forum. Or how about medicine at the RAMC Museum in Aldershot? School groups are a real goldmine for museums. Venue Hire might be another income stream that would save museums from charging exobrient admission prices. But these are things that most public sector museums have been grappling with for years. I do hope that Army museums can raise their game in years to come. It is so frustrating knowing that many of them have an aladdins cave of objects, documents and photographs, but are so short-staffed and cash starved that you cannot get at them. They usually charge just to visit their archives, and then charge the earth to reproduce photographs. Hence, the history of many Regiments and their men go hidden away. Which is a traversty. 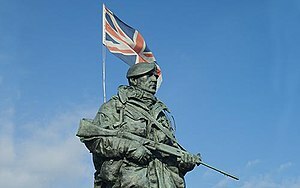 The famous ‘Yomper’ statue on Southsea Seafront is a memorial to the average, un-named Royal Marine. As iconic a monument as it is, it is perhaps symbolic of our understanding of military history – we worship the Regiment, and medal winners and famous battles, but do we actually know anything much about the men themselves? Now, thanks to a new exhibition at the Royal Marines Museum, members of the public can find out about the stories behind these remarkable men. Yesterday I went and had a look round ‘more than a name’, the new exhibition at the Royal Marines Museum in Portsmouth. I think its a very snappy name, and it describes the concept very well. As the Museum’s Archivist and Librarian Matthew Little explained, the idea is to try and dig beyond the names of former Royal Marines, and look at their stories. And their are some fascinating stories too. A Royal Marine aviator, A WW2 DCM and MM, and stories of commandos and ship service. The centrepiece of the exhibition is a display of kitbags, uniforms and other Royal Marine memorabilia. What I really like is that it is completely open – not behind glass – and you can actually smell them. I’m sure that displays such as this look so much better than behind glass, and not only that, but the openness is a metaphor for better public access. Obviously given my background in researching ordinary servicemen, I found the exhibition very interesting and right up my street. The Heritage Lottery Fund are notoriously cagey about funding capital projects that do not have any visible impact for the taxpaying visitor.The aims of this project are very much about access – both by showing the history of individuals who have served as Royal Marines, and improving the Museum’s archives to aid access. Encouragingly, the Exhbition has promoted many visitors to donate items to the Museum’s collection. As Matt explained, many visitors tend to assume that their ancestor’s documents are not of any interest, as they ‘didn’t do much’. But that’s exactly the point, we want to know exactly what the average bootneck was up to. If you put together the experiences of hundreds of these men, you can paint a pretty interesting picture. And who knows what objects unsuspecting people have got lurking in their attics? Matt also showed me around the Museum’s archives, which is not something that many military museums are as open about! The Museum holds a wealth of documents – mainly consisting of official documents that are not held at the National Archives, such as course records and maps. The museum also have a large number of large scale technical drawings of Landing Craft, which although might be pretty mundane to many of us, to modelmakers they are gold dust. Matt also explained that the Archives are very organic, as current serving Marines are encouraged to donate items, and to record their experiences for posterity. An example which might seem pretty run of the mill is that of combat boots. In the Falklands British boots were so bad that men went down with Trench Foot. This led to an improvement in boots soon after, but then when British forces deployed to Oman for exercises in 2001 Desert boots melted. Those are the official versions, but what do the men on the ground, the men who wore them, have to say about it? Projects such as this do represent a seismic shift for military museums. Traditionally regimental shrines, they are having to change their approaches, in a climate of budget cuts to the military. Not only that, but museums have changed in recent years, and visitors are more demanding about what they seek to do in their spare time. Putting a bunch of objects in a display case with some rudimentary labels might have been sufficient twenty years ago, but in 2012 we have to do more. And I applaud the Royal Marines Museum for their work. I can remember visiting years ago when the museum as focussed very much on the generals, the great and the good, battles, ships and drawers full of medals, but not much in terms of everyday service, and ‘real’ people. Whereas now, I think the museum incorporates the best of both worlds. The Ministry of Defence has recently reviewed its support for Army Museums, as a result of the well-publicised ‘black hole’ in MOD funding. The proposals could save the MOD more than £0.5m a year, according to an article in this month’s Museums Association Journal. At present many army museum staff posts come under the civil service. The MOD proposals are that 113 posts cease to be civil servants, and instead be funded by the museums. The review proposes to only fund one member of staff for each Museum from MOD funds, and this would lead to a reduction of another nine posts. Another proposal is to only support the Museums of disbanded Regiments for 25 years. This would lead to a fall in MOD funded museums from the current 69 to 36, based on current Army structures. The issue of antecedent regimental museums is a very sensitive one. The politics involved in regimental mergers, disbandments etc since the end of the Second World War have been complicated enough to give even the most diplomatic civil servant a migraine. 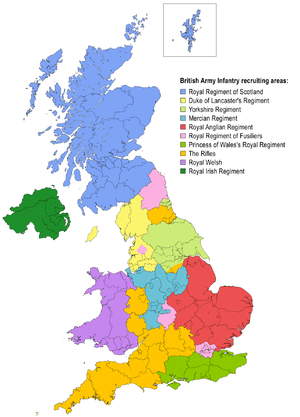 Just to give an example, the British Army currently consists of some 12 Infantry Regiments. In 1881 there were 74. With Cavalry, other Corps and Arms, the Ogilby Army Museums Trust currently lists 136 Army Museums in the UK. The MOD currently spends £4.3m on regimental museums, and £5.4m on the National Army Museum. Take for example, the merger between the Royal Hampshire Regiment and the Queens Regiment in the early 1990’s. The Although that was over 20 years ago, there is still a Hampshire Regiment Museum in Winchester. There is also a Queens Regiment in Dover, which is also titled the Princess of Wales Royal Regiment Museum. Confused? You will be even more, when you find out that there are also Regimental Museums for the Sussex, Surrey and Royal West Kent Regiments. Whilst it is very admirable that Regimental families wish to keep going their history in their local area, some of these museums are so small, and badly in need of overhaul, in terms of approach and environment. One example of good practice I can recall is that of the Rifles. Formed a few years ago from the Royal Greenjackets, Light Infantry, the Devons and Dorsets and the Royal Gloucestershire, Berkshire and Wiltshire Regiments. Obviously, this meant a variety of Museums around the South West. The Greenjackets and Light Infantry Regiment Museums in Winchester promptly merged – conveniently they were next door to each other – and the Berkshire and Wiltshire Regiment Museum in Salisbury now carries the title ‘Rifles’ in brackets. To see how Army museums have evolved, we need to understand how the have developed throughout history. Most army museums grew up independently, along regimental lines. Regiments have always ‘looked after’ their own history and heritage, out of pride, and also to educate new recruits about their new families history. British Army Regiments have always been a fiercely tribal lot, and this translates into museums too. Whilst some have modernised very encouragingly, some are still stuck in the stone age.Museums have changed immeasurably in recent years – priorities have changed, the market is more commercialised, and more focus is needed on aspects such as learning. Technology has also changed, as has society itself. The options are to either stand still and receive few visitors, or evolve and stay relevant. And it can easily be understood how this is very difficult for museums dedicated to Regiments that have been disbanded for decades. In some respects the state of Army museums is mirrored from the history of the Army itself – fragmented, tribal, and diverse. It is regrettable if cuts mean that some museums close, but perhaps it is an opportunity for rationalisation, and rationalisation does not necessarily have to mean moving backwards in all respects. In some respects cuts do force us to be more efficient than we might otherwise be in more plentiful times. I see it as an opportunity to improve standards – which, in my experience, are low where some regimental museums are concerned – and secure the future. Just a little reminded that I will be speaking at the D-Day Museum in Portsmouth this coming Remembrance Sunday. The Museum is open from 10am. I will be speaking at 12noon and 2pm, giving a short talk on my forthcoming book, ‘Portsmouth’s World War Two Heroes’. Entry to the Museum is free all day, and there is no need to book. I’m just putting the finishing touches to my notes. If you come down, feel free to say hello and ask me anything you like! I’m very pleased to announce that I will be speaking at the D-Day Museum in Portsmouth on Remembrance Sunday this year, 13 November. I will be talking a look at the sacrifices made by 2,549 men and women from Portsmouth who died between 1939 and 1947, and telling some of their stories. It should be an interesting little taster of my forthcoming book, due out in February 2012. The talks will begin at 12noon and 2pm (same talk each time), and the Museum will be free all day, opening at 10am and last admission at 4.30pm, closing at 5pm.